“DNA GLOBAL BIOMEDICAL SOLUTIONS” is a Cypriot entity that brings together a team of world accredited doctors, bio engineers and executives, specialized in chronic pain management. There is evidence that health systems are only minimally effective in treating patients with chronic pain. Much of the available evidence on the direct costs of chronic pain indicates that ineffective or inefficient management of pain is responsible for a significant proportion of costs. Even small increases in the effectiveness and efficiency of pain management services could reap large economic rewards for governments and society. We will focus on expanding knowledge and skills on pain management among healthcare professionals in hospitals, and train them in Radiofrequency (RF) and Cryoanalgesia interventional pain techniques (gained almost universal acceptance as the procedure of choice for minimally invasive treatment of pain disorders) and other pain management techniques. Our training program lasts 3 months in which period each of our training teams can train a group of 7 doctors. We have the ability to train up to 6 groups of doctors simultaneously. As training will go on, the trained doctors will have the knowledge to train other doctors and multiply the service to your population. Our team watches closely industry trends and links up with academic pain centers in America and Europe to maintain and upgrade standards of pain management training, in order to provide the highest quality of training to your doctors. Our unique competitive advantages give us such confidence as to suggest our company for your partner to achieve a reduction of over 60% referral rates of public health care spending regarding chronic pain. Our advanced treatment options using the latest technologies, including nerve blocks, radiofrequency and cryoanalgesia ablation, is your best guarantee. 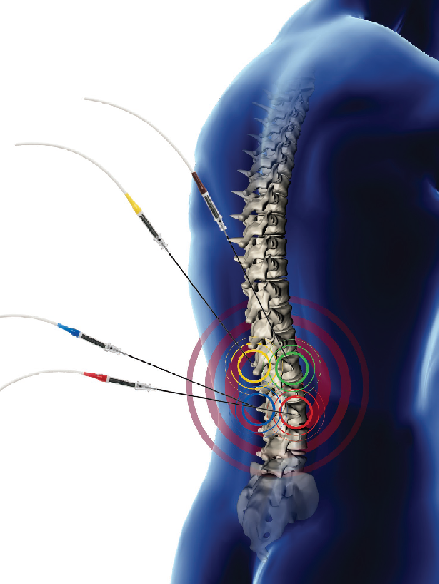 Experienced and world accredited interventional pain specialists to educate your medical staff in performing RF and Cryoanalgesia pain management operations – we have assisted in performing numerous operations with over 90% success rate. The use of state of the art technological medical equipment and supplies. These ensure the highest level of success rate, close to 90% and immediate positive effects. Close co-operation with international teams of experienced physicians in pain management for consultation after the end of the training period.